In the following article, we'll explore the stack specific options of Integrity, without further ado, let's get started. 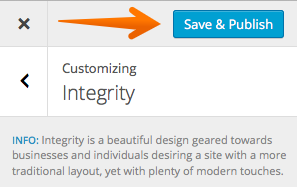 As explained in the customizer introduction here open up the WordPress Customizer to start, if you don't already have integrity selected, you'll need to change your stack to continue following this article. 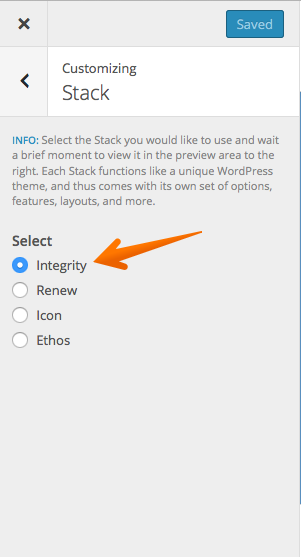 Then choose "Integrity" in the stack selection. 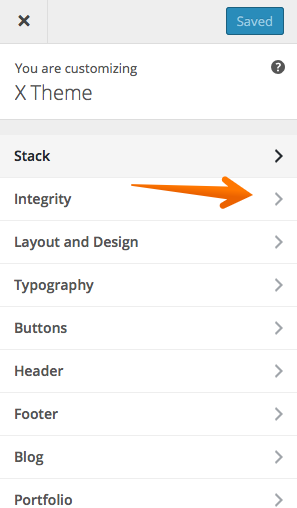 Now you're back at the main section of the customizer, you can proceed to edit the integrity stack as needed, so go ahead and click on "Integrity" which should be directly under the "stack option". 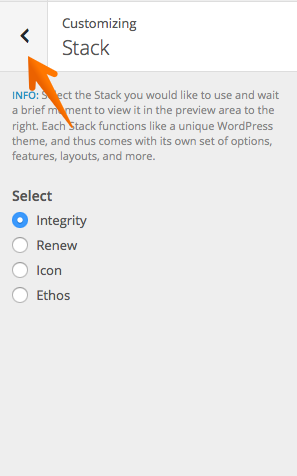 Integrity comes with a variety of options, which we'll explore below, we'll check out each option and provide screenshots along the way. 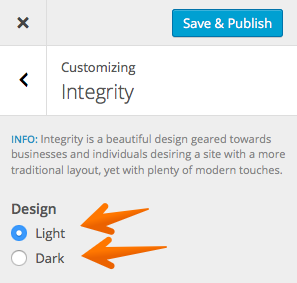 There are two provided design options for integrity, one being the "light" version and the other being a "dark version". As you can see, in just one click we've completely changed the look of the site, if you want to save the changes at all, just click on "save and publish" at the top. Topbar transparency, is quite a self explanatory options and simply sets if the Topbar is transparent or not. Navbar transparency is also quite self explanatory, it simply sets if the navbar is full transparent or not with the options either "on or off". Footer transparency is very similar to both Navbar transparency and Topbar transparency, expect of course, it's for the footer instead. This options again comes with a simple "on or off" toggle. Notice how the footer area now is solid white, rather than being transparent which was showing through our background color when footer transparency was set to on. Enabling the blog header will turn on the area above your posts on the index page that contains your title and subtitle. 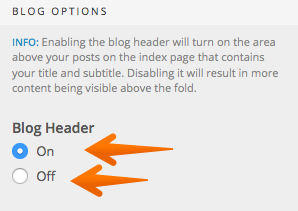 Disabling it will result in more content being visible above the fold, let's take a look at how turning on and off this option effects our site. Now if we set our blog header to Off, you'll notice that there's now a lot more content visible above the fold, all through using one simple option, another great choice for customizing your site. The first option is for the sort portfolio text. Which is the text that shows on the portfolio sort button. The last option is for Portfolio index sharing. 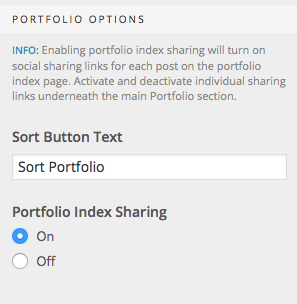 Enabling portfolio index sharing will turn on social sharing links for each post on the portfolio index page. Congrats! You should now have a better understanding of the various Integrity specific options.